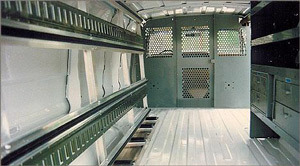 Inside Rack for Vans Aluminum, 84' long by 48" high with 5" ledgeboard. 2 rows of slotted E track and 2 straps. Other options available.